SRAM and TruVativ GXP cranks require this bottom bracket. This bottom bracket is a threaded, external cup unit and includes left and right bottom bracket bearing cup set for use on Giga X Pipe(GXP) cranks, such as SRAM X.5, X.7, X.9, and X.0, GX, X1, X01, XX1, SRAM Apex, Rival, Force or Red GXP type cranks. Includes spacers that are only needed for installing a MTB crankset on 68mm bottom bracket shell; spacers are not needed for road cranks. Updated GutterSeal improves sealing while reducing drag. I bought this to replace my bottom bracket to use with a Truvativ compact crank (GXP style) for my road bike. Very easy to instal, fits like a glove and is buttery smooth. I only wish I had done this a lot earlier and with such a great price, will probably replace on a more frequent basis. This is a nice, basic bottom bracket. I use this with my XX1 crankset. I've only done a few rides but so far so good. I'll report back when there's a problem. 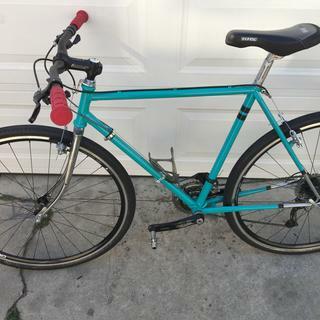 My bike is about five years old, never changed out this part but did a complete drive train overhaul including chain, chain rings, cassette, rear derailer and cable. Everything seemed good but when I did a spin test the cranks would only go two revolutions at best (with chain on) Greased up the old GXP BB but not much improvement, it had lots of drag. Replaced this in 30 minutes and cranks spun at least twice as much, 4-5 times around. If in doubt, just replace this item, way too cheap to second guess..it's priced to be disposable. did more research on this than I thought needed but my conclusion is sound, it may not be the best but you don't have much of a choice and replacing it is easy and cheap. Delivery was on the day specified. Shipping box was crumpled on three sides, but the product packaging was undamaged. Perfect fit! Product was well specd. Thank you team Jenson! As always you make it easy to shop for my every need. Easy to install and quality feel. Preforms and feels like my xo1 group set and a lot more affordable. Easy to install and works well in some of the worst conditions. Easy to install (once I got the old square taper out), and it works great. Just what I needed. Best to use the proper special wrench on this. Easy to install and a great product for the price. Threaded. The way a bottom bracket should be. This works well, and is all you need for a threaded B.B. Very easy to install and my cranks spin much more freely now. fourth or fifth one over the years. Great BB for the $. looks great, and is super easy ot install. Relatively inexpensive but seems to work well. No problems. The cranks go in, and they turn! The Stylo will not fit a Shimano external BB... has to be GXP. Easy install and looks great!! Great service and speedy delivery!!! Yes delivery was on time. Very nice upgrade from my OE suntour setup. This BB does what it's supposed to; spin freely and never make me think about it. It has a nice finish and makes a solid interface between my frame and cranks. 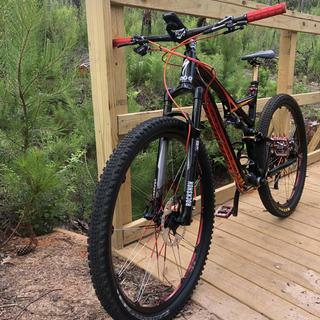 The factory installed BB seized half way through a 30km XC ride. Originally I was going to order via Amazon but Jenson USA ships to FPO addresses so I went with them. The replacement BB arrived very quickly (along with a few other items I ordered). The BB was easy to install and now I can pedal my bike so much easier. I was torn between this one and the ceramic bearing GXP BB but I decided to go with the cheaper option. It is great to have my trusty steed back on the trail. Thanks Jenson I'm a happy customer! Good BB at a cheap price to buy 2 and keep 1 as a spare just in case! Always buy from Jenson and will continue to do so. Thanks to Jenson and their quick shipping, I was able to be back on the trails. Thanks! Pay the extra clams. The finish is nice. You'll be smiling every time you look at it. Bought this to replace original equipment. Super easy to remove the old and replace with new. Buttery smooth for such an inexpensive product. Happy customer. One of the smoothest spinning BB's I've used. Out of the box this BB performs almost as well as a Hope BB for 1/4 of the price. I was really impressed with the quality of this BB. I was trying to isolate a creak and mistakenly thought it was my previous GXP bottom bracket. So now I know it wasn’t my B.B. ! But at this price it’s a no brainer. Now I have my old one for that Franken-build I’ll put together someday. 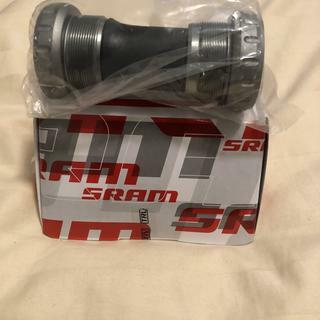 I ordered the SRAM GXP bottom bracket from JENSON and the service was excellent. I received it before the expected date and as promised there was no extra tax or duty from the border crossing. The item came well packaged and protected. In total I was very impressed with my first experience buying online drone these guys. Just like all other Sram products it works and fits great!! Used on my road bike no problems. This item is standard on all my bikes. Good price and gets the job done. I have had one for over 10 years now and is still going strong. Bought another for a second build. Quality product, easy install, just what I needed to complete a project I was working on. Good fair price too. This is an easy to install replacement part. (I just did my first such installation on my travel bicycle. ) It is relatively inexpensive but my experience has been that they do not last as long as I would like or expect. This is tempered by the fact that they get very heavy use on my touring bicycle as I am 6 feet 6 inches tall and loaded touring gear adds another 35-40 pounds to the bicycle's load. Use includes some days of rain and limited maintenance while touring. Good so far. It was a little odd to instal with cranks but a good system overall. Maybe not the epitome of durability. But for my money - pretty dang close. Got a GXP outboard BB in a hardtail I built in 2009, that's been ridden in wet & mud that will keep most riders hiding under their sheets. For a few years anyway, when it was one of my primary rides. Still use it off road - but mostly for path days now. Either way, I'm just now feeling the beginnings of a hint of wear. Pull it & clean/lube maybe once per winter. Weather-wear seems to be pretty darn good. Looking forward to this one lasting a good long time. And when it's time to retire it - cost of a replacement sure won't break the bank! Solid and works as advertised. No surprises. Very easily install and well build. Not the lightest but competitive. Easy to install, like the GXP system where no bearing preload is needed. Wish it came in black, was the only drawback. Installed these when I upgraded crankset to a Sram GX1400. Smooth, seem durable enough with good seals. Which bottom bracket tool does Jenson sell that will work with this bottom bracket for install? BEST ANSWER: There are several tools that will work to install the bottom bracket. However, because one needs to install the bottom bracket to the frame and then attach the detachable crank arm to the axle, a combined tool is useful. I use a tool like the Park BBT-9 Bottom Bracket tool. Shimano BBT-9 around $20 or for cheaper the Foundation Shimano Style BB tool $10. I intend to install this into a specialized Jynx that has a 73mm bottom bracket shell. Will this fit? BEST ANSWER: It fits 68mm and 73mm bottom bracket shells. I have an epic 2013 that uses crankset sran S-1250, I would like to confirm, if this bottom bracket fits in my bike? I believe the sram pf30 is the bottom bracket you need. Will this work for the truvativ descendant? I would think that it would work for any GXP crank. I would make sure it works with your frame though. Will this work with the Sram GX1000 x sync? BEST ANSWER: Yes, it will work with the GX1000 30mm spindle as long as your frame BB shell is 68/73mm standard (BB comes with spacer for 68mm applications). Is this a 24 mm drive side -22 mm none drive side? BEST ANSWER: Yes, Sram GXP bottom brackets are sized 24/22. Will this fit Sram omnium? BEST ANSWER: Yes. Spindle diameter on the Omnium is for the Sram GXP style BB. 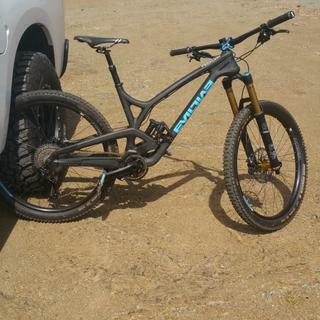 I have a 2014 Trek X-caliber 8. The cranks are SRAM S800, will the Bottom Bracket fot my bike? Thank you. BEST ANSWER: It depends...looks like the Sram S800's have been around for a while. It looks like there is a GXP version as well as an ISIS Gigapipe version. One way to tell is...do your S800 Cranks have a bolt holding them onto the BB spindle on the drive side of the crank? If there is a bolt there...you need an ISIS Gigapipe BB. If there is a hole right in the center of your drive side crank arm with the only bolt being on the non-drive...then this GXP BB will work. My bike has 68 mm BB shell. Do I need to use spacers with SRAM Apex 1 S350-1 crankset, which is considered road crankset? BEST ANSWER: When installing the SRAM GXP Bottom Bracket in a road frame, do not install any spacers. Hi, may I know what is the difference between 73mm english and 73mm euro bb? BEST ANSWER: They are the same. Will it fit on a Jamis Parker I frame? BEST ANSWER: Should fit fine. Hello i just bought one of these bottom brackets and it wont fit in my 2012 rocky mountain slayer 50. However i tried multiple other bottom brackets and they all fit in the frame. This bottom bracket also fits in different frames so i do not know what the problem is.